When Winnie-the-Pooh: Exploring A Classic was at the Victoria and Albert Museum in London in early 2018, I was sorry to miss it. It was winter, and a trip to London was not in the plans, but I was desperate to see the exhibit and ordered the catalog as a beautiful – but not quite the same – substitution. Later, when I read that it was being shown at the Museum of Fine Arts in Boston, I was thrilled. In fact, I was quite possibly the first person to order member tickets the day they became available! The Winnie-the-Pooh stories are so deeply entwined with Shepard’s drawings that when most of us think of Pooh, Piglet, and Eeyore, we are imagining the humorous, warm, and emotionally honest drawings by Ernest Shepard. Piglet could not be Piglet without his small frame next to Pooh’s cozy and round body. The Wall in the Middle of the Book by Jon Agee is a picture book by one of the smartest and most creative people in the children’s book world. I remember reading The Incredible Painting of Felix Clousseau, one of Agee’s early picture books for the first time and beginning to look for everything by him. Since then, I’ve been a big fan of all of his books, especially Milo’s Hat Trick and Life on Mars. His new book is funny and intelligent – and timely. A small knight is determined to fix a wall that runs down the gutter of the book. He’s certain there are dangers on the other side of the wall: “The wall protects this side of the book….from the other side of the book.” But it soon becomes clear there are dangers on his side of the wall of which he’s completely unaware. There are lots of opportunities for discussion with this book. Younger kids will enjoy it, but older students might be encouraged to ask about perspectives and perceived dangers. Last week I wrote about a picture book by Kallie George called Goodnight, Anne. The author was clearly inspired by Anne of Green Gables because she has also written the first installment of a new early chapter book series: Anne Arrives. The plot follows Anne’s story of arriving at Green Gables making it a lovely introduction to the classic novel. The illustrations by Abigail Halpin are beautiful and capture the spirit of L.M. Montgomery’s novel perfectly. This would be a lovely gift for a young reader who is ready for a new – and special – series. Finally, a tribute to the classic picture book, Roxaboxen by Alice McLerran, by the students in one of Inly’s Upper Elementary classrooms…. Driving into work this morning, I thought of a bunch of topics I wanted to include in the blog, but couldn’t decide which one to write about today. So…here’s everything! 1. Congratulations to the winner of this year’s National Book Award for Young People’s Literature – Thanhha Lai, the author of Inside Out and Back Again. I haven’t read Lai’s book yet, but it has moved up a few positions in my “to read” stack. 2. Jon Agee is one of my favorite picture book authors and illustrators. If you haven’t read Milo’s Hat Trick or The Incredible Painting of Felix Clousseu, go to the library today. His books are smart and funny and are reliable favorites at school. Over the weekend, I read that he is writing a Christmas story called Little Santa, but it won’t be published until the fall of 2013. Something to look forward to besides the presidential election! 3. I read Marcelo in the Real World by Francisco X. Stork this weekend. Speaking of books that have been on my list – this one took an embarrassingly long time to read! 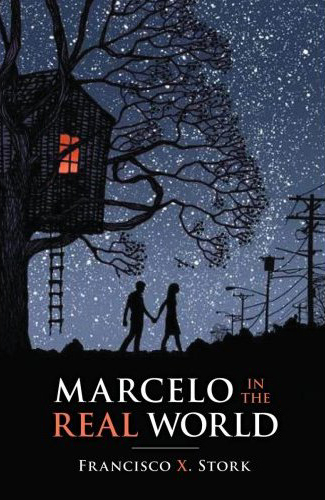 A combination of John Grisham and The Curious Incident of the Dog in the Night Time, this moving coming-of-age story is about Marcelo, a teenager who is somewhere on the Asperger’s spectrum. His father gets him a summer job in the mailroom of his law firm so that Marcelo can experience life in the “real world,” but as it turns out – the “real world” finds Marcelo without his dad’s assistance. It’s a sophisticated story, one where the action is psychological rather than physical. In some ways, it reminds me of Donna Jo Napoli’s picture book, Albert. Like Albert, Marcelo steps outside of a protected environment and learns that it’s a complicated world out there.